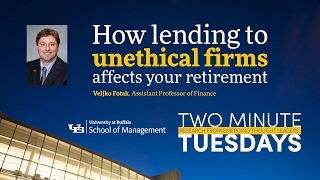 Veljko Fotak has been quoted in business and mainstream media — including the Washington Post, Wall Street Journal, Bloomberg Business and New York Post — for his expertise and research in stock markets, corporate financing, sovereign wealth funds and government ownership and the cost of debt. His research also addresses cross-border financing, government expropriations and market crashes. Veljko Fotak can be reached most quickly through Jackie Ghosen in the School of Management Communications Office at 716-645-2833 or mgt-pr@buffalo.edu.